Dr. Elizabeth Jekot, medical director of the center, is passionate about the early detection of breast disease. A graduate of TCU, UT Southwestern Medical School Dallas, Baylor University Medical Center Dallas radiology residency program and a breast imaging fellowship, she has focused the last 23 years of her professional career to creating and sustaining a patient-centered, love-based practice. She is a 16 year breast cancer survivor, and understands breast cancer not only from a medical but an emotional perspective. Fulfilling a dream, Dr. Jekot opened this imaging center in 2005. 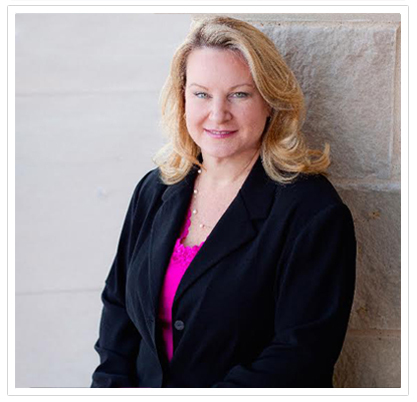 To secure the future of the practice, she joined forces with Baylor Scott and White Medical Center-Plano in 2011. Inspired by the leadership and vision of Jerri Garison, president of BSWMC-Plano, Dr. Jekot selected this hospital as a partner to best serve her patients. Dr. Elizabeth Jekot is passionate about the early detection of breast disease. A graduate of TCU, UT Southwestern Medical School Dallas, Baylor University Medical Center Dallas radiology residency program and a breast imaging fellowship, she has focused the last 23 years of her professional career to creating and sustaining a patient-centered, love-based practice. She is a 16 year breast cancer survivor, and understands breast cancer not only from a medical but an emotional perspective. Andrea L Lundell, M.D graduated from Yale University School of Medicine, completed a residency in Diagnostic Radiology, and a fellowship in MRI. Dr. Lundell has extensive experience in diagnostic and basic interventional radiology. 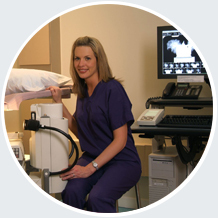 With nearly 20 years as a radiologist and breast imager, she is proud to have been affiliated with the Elizabeth Jekot MD Breast Imaging Center since 2010. In 2012, she was diagnosed with breast cancer by her friend and colleague, Dr. Elizabeth Jekot. Because she found Andrea’s cancer very early using breast MRI, systemic chemotherapy was not required. She continues her dedication to the battle against breast disease alongside Dr. Jekot with an empathetic attitude and a fierce determination to provide patients with the best care possible. 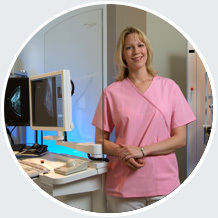 We offer digital 2-D and 3-D mammograms for screening and diagnostic evaluation. Check your insurance to see if it covers 3-D.
We offer 2-D ultrasound to assess lumps found on clinical breast exams or mammograms and 3-D ultrasound for screening patients with dense breast tissue. We offer needle biopsy with a sonographic, stereotactic, or MRI guidance to sample suspicious lesions. We have a dedicated breast MRI unit and offer screening for high-risk patients and staging for newly diagnosed cancer patients. We offer bone mineral density exams to screen for osteopenia and osteoporosis, which helps determine a patient’s risk for fracture. Automated Breast Ultrasound, ABUS, is the only FDA approved device for screening women with dense breasts. Adding ABUS to screening mammography has been demonstrated to increase cancer detection by 55% in patients with dense breast tissue. This number is significant because 40% of women eligible for mammographic screening have dense breast tissue. For this exam, women lay down on an exam table and a layer of lotion is applied to the breast. 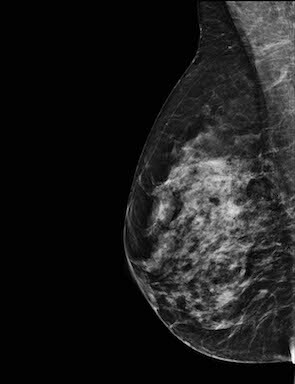 Then, a scanner is firmly positioned on the breast to create the images. The exam takes approximately 15 minutes and creates 3-D ultrasound images which will be reviewed by the physician along with the woman’s mammogram. The video demonstrates the visualization of a cancer that is not perceptible with 2-D imaging, but is clearly seen with 3-D. While 2-D mammograms are a static image of the breast, a 3-D mammogram, also called a tomosynthesis, captures many images of the breast. Imagine the breast in mild compression as a book with clear pages and white text. A 2-D mammogram is a picture of a book without its front or back cover, but many of the words may be superimposed, possibly obscuring a significant finding, or creating a false finding. A 3-D mammogram allows the radiologist to flip through the pages of the book. This increases the ability to find early breast cancer while decreasing the number of callbacks from screening for additional imaging.